The crucial element to the summer’s outside-all-day lifestyle? Cold treats that help us cope with sweltering days and refresh us on endless nights. To celebrate the arrival of summer and savor the warming sun, we’ve collected 12 frozen treats for any occasion that calls for a proper cool-down. The variations of ice cream are many, yet the basics are simple, and frozen cream is always a bulletproof recipe for success. So, instead of spending all your money at the local gelato shop, here’s the scoop on how to make these creamy classics at home! Dare I make a bold statement here? Vanilla ice cream is highly underrated! Even though its modest ingredients often pale in comparison to the overwhelming flood of innovative ice cream flavors, sometimes simplicity really is the expression of perfection. True to its French origin, this creamy parfait oozes elegance with flavors dominated by rich, silky honey, earthy walnut, and a touch of Grand Marnier. It’s sure to impress your guests at the end of a summer barbeque. This delightful Japanese invention is becoming increasingly popular with its naturally vibrant color and sweet vegetal taste thanks to the Matcha powder. We added lime juice and mint for serving to give it an extra refreshing and summery touch. Although we wish we could spend every summer day eating ice cream, the hefty calorie count often forces the freezer door shut. But instead of longing and lingering after that luscious, cold, and creamy goodness, here are some satisfying alternatives that won’t leave you regretting an indulgence. What if we told you that you don’t need dairy to get that creamy comfort you’re craving? All you need is fruit! And no, we’re not talking sorbet, we’re talking nice cream. What is the cream factor? Enter frozen bananas! Simply add some mango to the equation, plus a touch ginger and lime for a bit of zing, blend, freeze, and voilá! Another recipe that proves: no dairy, no problem! By substituting coconut milk and frozen bananas for cream, you can cheat your way to that creamy rich flavor and velvety smooth texture. To cut the calories even further, use light coconut milk and add an extra frozen banana to achieve the perfect texture. 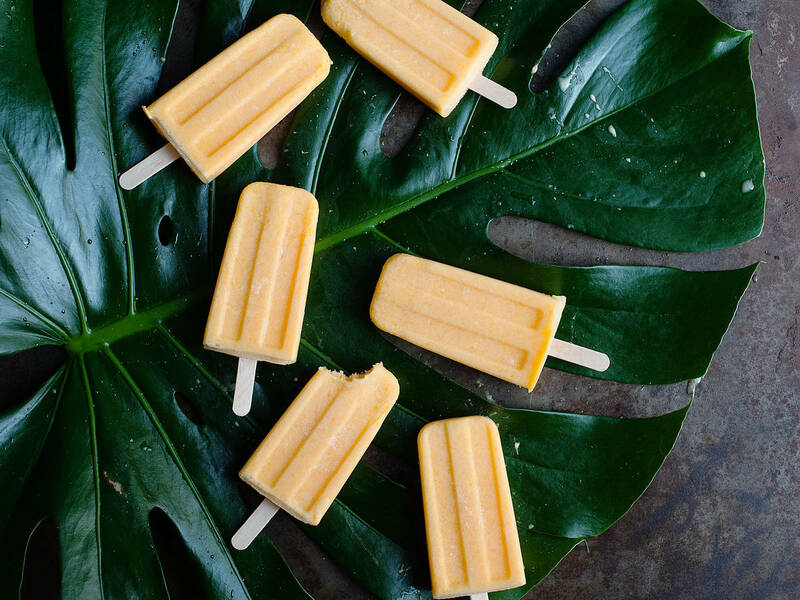 These bite-sized treats are the perfect quick fix to beat the heat on a hot summer’s day. Conveniently stored in an ice cube mold, ready at any moment to pop out of the freezer and into your mouth, they’re only 27 calories per bite, and completely guilt-free. The sweet smell of strawberries and the bright, citrus burst of oranges are undeniably linked to warm summer memories. When frozen, fruits are like solidified bits of sunshine, able to revive and refresh. Here are some juicy recipes that will surely appeal to everyone. Four ingredients and no ice cream maker required, this recipe is an easy and straightforward way to make the best of strawberry season. Enjoy as a refreshing midday treat, dessert, or even serve in a glass with prosecco for a sweet summer aperitif. This recipe is basically frozen raspberries, dressed to impress. Despite the fancy name and look, granita requires minimum effort. A Sicilian classic, it never ceases to amaze at the dinner table. If you don’t have a popsicle mold yet, may we suggest you run to the store asap? Making your own popsicles is easy—if you have juice and a bit of sugar, you’re more than halfway there. For adult taste buds, add a little vodka and you can transform a classic screwdriver into a popsicle, a fun boozy treat for your next summer party! Getting your favorite bunch of friends over for a summer get together and looking for a sweet treat to top it off? Keep a cool head—your freezer is your best friend when it comes to prepping ahead for a fabulous finish. Here are three delightful frozen cakes to satisfy any crowd—large or small. Strawberries and cream go together like, well.. strawberries and cream. And this frozen version of the classic combination is sure to melt the heart of any strawberry-lover in the room. Combine it with a cheeky touch of white chocolate and watch those slices disappear. Essentially a fluffy, frozen cheesecake, this may be the most delicious way of getting your coffee fix. The bitterness of the espresso powder compliments the sweet creaminess of the other components perfectly. This addictive treat will leave your guests craving for just another bite. And another one. And…. Layer upon layer of cream cheese, jam, and Oreo cookies, this cake is sure to give you and your guests a bit of everything you want; something sweet, something fruity, something rich, and something crunchy. A more harmonious balance of texture and taste has yet to be created! What is your favorite frozen treat? Tell us in a comment, or send us your recipe to community@kitchenstories.com!